Transporting you to South America where our local expert will answer all your wildlife questions. Streaming live footage from the Guapi Assu reserve in south-eastern Brazil, the World Land Trust’s (WLT) new webcam takes you to the heart of the habitat we are helping to protect with our project partners REGUA. Never knowing what will appear on screen next – from an array of hummingbird species, to cartoon-like toucans – the webcam is a glimpse into the life of the rainforest, as it happens. Filmmaker and conservationist, Luciano Breves, set up the webcam to capture the wildlife that he is dedicated to protecting. As WLT’s multimedia officer based in Brazil, Luciano is passionate about sharing the wildlife that he sees everyday with the rest of the world. His enthusiasm is certainly rubbing off and the popularity of our weekly webchats has soared. Don’t miss your chance to have all your wildlife questions answered by Luciano who is online all day every Tuesday. We also have two other webcams; one in Ecuador that has been running for nearly two years and a second in Brazil’s Parana State, which Luciano also set up. You can now watch all three webcams at the same time from the website, so you won’t miss any of the action. Regular viewers of the webcams will recognise the usual visitors, including the Swallow-tailed Hummingbird, Black Jacobin, Brazilian Tanager and the Plain Parakeet. The new REGUA webcam hopes to capture other species, such as the Rusty-margined Guans (Penelope superciliaris), which has become a regular visitor to the reserve now it is Brazil’s summer (British winter). Species vary throughout the year, with the White Woodpecker (Melanerpes candidus) and Maroon-bellied Parakeet (Pyrrhura frontalis) having been spotted at birdfeeders throughout Brazil’s winter months. 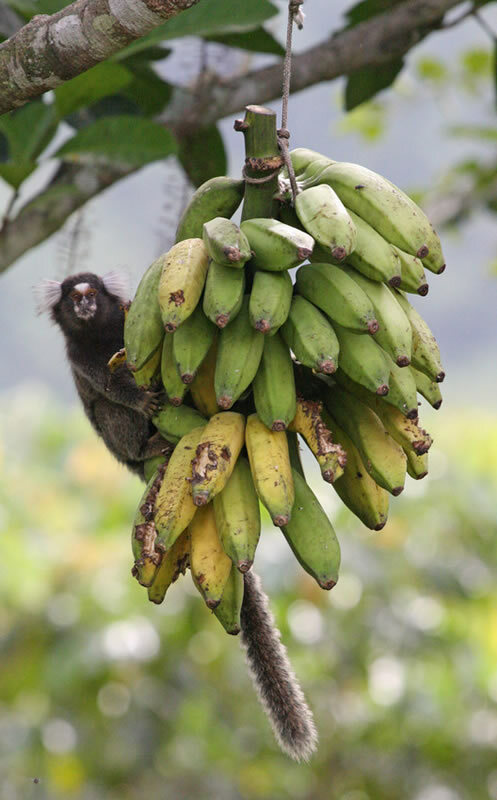 Along with a fantastic array of bird species, the REGUA webcam is also visited by Common or White Tufted-ear Marmosets (Callithrix jacchus). As its name suggests, this New World Monkey is characterised by the fluffy tuffs of white hair surrounding its ears. All three webcams offer an insight into South America’s wildlife that should not be missed.